Click here to download a free pdf copy of Banded Together. 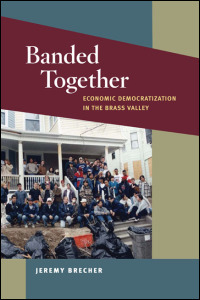 Providing incisive commentary on the historical and contemporary American working class experience, Banded Together: Economic Democratization in the Brass Valley documents a community’s efforts to rebuild and revitalize itself in the aftermath of deindustrialization. Through powerful oral histories and other primary sources, Jeremy Brecher tells the story of a group of average Americans–factory workers, housewives, parishioners, and organizers–who tried to create a democratic alternative to the economic powerlessness caused by the closing of factories in the Connecticut Naugatuck Valley region during the 1970s and 1980s. This volume focuses on grassroots organization, democratically controlled enterprises, and supportive public policies, providing examples from the Naugatuck Valley Project community alliance that remain relevant to the economic problems of today and tomorrow. Drawing on more than a hundred interviews with Project leaders, staff, and other knowledgeable members of the local community, Brecher illustrates how the Naugatuck Valley Project served as a vehicle for community members to establish greater control over their economic lives. Jeremy Brecher is an award-winning documentary filmmaker, historian, activist, and writer. His other books include Strike! and Globalization from Below: The Power of Solidarity. He lives in western Connecticut. This book is dedicated to the people of the Naugatuck Valley, who have educated me, sustained me, and taken me unto them as their pet outsider. I can truly say of the valley, as Herman Melville’ Ishmael said of his whale ship, that it has been my Yale College and my Harvard. If all the people in a city are banded together to make it a better place to live, then it will be a better place to live. That’s what the Naugatuck Valley Project is all about. The NVP’s experience is relevant to a basic unsolved problem of modern civilization: most people’s lack of power over the economic forces and decisions that affect them. I think the Naugatuck Valley Project is an embryonic sign of what has to develop in the future on a much broader basis for this society to survive and be strong. Learn more about the Naugatuck Valley Project. Learn more about “Banded Together,” the participatory community history project.